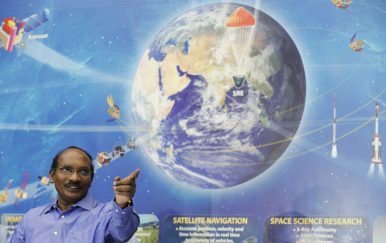 Indian Space Research Organization (ISRO) Chairman Kailasavadivoo Sivan gestures during a press conference at their headquarters in Bangalore, India, Jan. 11, 2019. While the world has been focused on China’s impressive space firsts, notably the Chang’e-4 landing on the far side of the moon, and U.S. proposals for a Space Force, India is seeing steady progress on its own comprehensive space program. A number of important policy changes have been made and are in the works. These changes reflect both a changing international environment where nation states are competing across categories of prestige, military capability, and economics, as well as India’s increasing material wealth and technological capability. A Standard Chartered report forecasted that India will overtake the U.S. economy ($31 trillion) in nominal GPD terms by 2030, to become the world’s second largest economy at $46.3 trillion, only behind China ($64.2 trillion), projected to be the top economy. There are some who question the relevance of space activities in a developing nation. To us, there is no ambiguity of purpose. We do not have the fantasy of competing with the economically advanced nations in the exploration of the moon or the planets of manned space-flight. But we are convinced that if we are to play a meaningful role nationally, and in the community of nations, we must be second to none in the application of advanced technologies to the real problems of man and society. The ASAT test demonstrated India’s capability to hit adversary objects in space, a capability the DRDO has possessed since 2012 but showcased only now after years of restraint. Concerns that China could hold its critical infrastructure at risk prompted India to showcase its own retaliatory capability as a deterrent to any Chinese coercion. This was the first time that we have seen the DRDO involved in a space mission, and the first time that the Indian Space Research Organization (ISRO) has participated in a weapons test. Moreover, in the wake of the test, Prime Minister Narendra Modi directed National Security Advisor Ajit Doval to create a draft space doctrine. That, along with recent moves by China, Russia, and the United States to create dedicated Space Forces, may give impetus to desires to move from a small integrated space cell to a dedicated military space organization. We can expect further cooperation between the ISRO and DRDO. Already the ISRO has launched payloads on Microsat-R and EMISAT, and it has just been announced that beginning in May, the ISRO is expected to launch a string of defense satellites. Another major shift is the growth of India’s private space sector. For the very first time, India has succeeded in its desire to have the ISRO transfer satellite building technology to the Indian private sector, with a recent successful launch of a consortium-manufactured navigation satellite. It is expected that the first private consortium-built version of the Polar Satellite Launch Vehicle (PSLV) will be delivered and fly in 2020. The PSLV, which already holds the record for the most number of satellites on a single launch (104 in February 2017), just achieved a new record of launching 29 satellites to three different orbits. Among the satellites launched was India’s military intelligence gathering satellite, the 436 kilogram EMISAT intelligence satellite. Perhaps more impressive in the long run, entirely private Indian space start-up Exceed Space successfully built and launched the first NewSpace satellite on a SpaceX Falcon 9. The Indian space industry also broke new ground with the ISRO, for the first time spinning in technology from a start-up, Bellatrix Aerospace. Those are landmark achievements building confidence for the Indian space industry, which hopes to service a global market. The industry now includes at least seven companies, including Bellatrix, Astrome, Satsure, Earth2Orbit, ReBeam, TeamIndus, SmartEnovations, and others. India even now has a youth-focused rocketry club (such clubs were important in creating an initial talent pool in the first space age). India’s most prominent private space company, the one that started it all, TeamIndus (Orbit Beyond), which competed in the Google Lunar X-Prize, recently was selected as one of the companies able to provide Commercial Lunar Payload Service (CLPS) to NASA. The excitement generated by these gains and the activism of the NewSpace community have succeeded in getting the ISRO to engage more widely with youth and the populace, including setting up a visitor center, allowing the public to watch rocket launches, and establishing space museums across the country. India’s state-based lunar program, Chandrayaan 2 Lunar Mission though having experienced some delays, is expected to launch its own lunar rover to the moon next month. It will be attempting to land on an ancient high plane just 600 km from the Lunar South Pole, joining a significant amount of lunar activity. Both India’s next lunar mission (Chandrayaan-2) and its manned mission (Gaganyaan) rely on India’s new heavy lift rocket, GSLV-Mk 3, which launched successfully in November of 2018 and is capable of placing large communication satellites (4 metric tons) into geostationary transfer orbit (GTO) or 10 metric tons to low-Earth orbit (LEO). Previous space missions are also providing significant returns. India’s Mars probe, Mangalyaan, is helping understand methane mysteries on Mars that may be the first evidence of simple life on that planet. The new global space competitive environment also seems to be forcing India to consider better regulation of its commercial space activities. The Indian Parliament is currently considering a draft Space Activities Bill. Responding to what looks to be a global scramble for space resources, India’s elite discourse is also shifting. In the last few years, several of India’s space and nuclear scientists, to include Dr. Sivathanu Pillai, professor and former chief of BrahMos Aerospace, specify that, “there are plans to mine Helium-3 rich lunar dust, generate energy and transport it back to Earth.” This perspective is supported by Dr. Srikumar Banerjee, former director of Bhabha Atomic Research Centre (BARC), who asserts that the future lies in minerals wealth mining in space. Technology Information, Forecasting, and Assessment Council (TIFAC) Executive Director Prabhat Ranjan believes that the potential exploitation of moon and asteroids as a mineral resource can be a big game-changer. Even think tanks such as CSTEP have been looking at space-based solar power. While the discourse on space-based resources has not reached the level of national level articulation as we see in the United States or China, it is not unrealistic to forecast that it will become an integral part of India’s space policy given its growing capacity for space access and power projection. As seen by India’s recent ASAT test, India’s fears of being shut out from a governance regime (as happened with the nuclear Non-Proliferation Treaty) are likely to force sufficient steps before the emergence of a technology governance regime to ensure New Delhi will at least have a seat at the table. In summary, we can observe significant shifts both in India’s observed capabilities and policies since 2018. These include successful commercialization progress on both launch vehicles and satellites (and the introduction of a Space Activities Bill), a heavy lifter capable of manned missions to LEO and robotic missions to the lunar surface, an announced human spaceflight program, and perhaps the most critical shift, the involvement of the DRDO and ISRO in an ASAT test. That test signifies that India’s space program has entered into the realm of military counterspace capabilities. For a country previously careful to project itself as a peaceful, responsible nation on the international arena, and its space program as entirely peaceful, India’s ASAT test marks a significant shift in policy. Its willingness to accept significant reputational risks associated with some 400 pieces of space debris or charges that it could have potentially violated Outer Space Treaty (OST) obligations indicate that India now prioritizes the security of its critical infrastructure from adversary attacks over such normative concerns. Moreover, there is an additional novel component to India’s ASAT test. While most of the current focus on “space warfighting” assumes military targets for ASAT weapons (called “counterforce” targeting), reporting suggests that India is pursuing a retaliatory capability to target an enemy country’s economy, stock markets, navigation, and weather infrastructure (called “countervalue” targeting). Such a targeting doctrine suggests that India views the ASAT weapon less as a warfighting weapon and more as a deterrent. The ASAT test, coupled with India’s recent cross-border air raid into nuclear-armed Pakistan, suggest that India has undergone a shift in its strategic culture. Historically wary of being seen as an assertive major power, India’s changing space policy suggests that India is quite willing to attend to its security interests even given normative costs, and willing to project itself as a technological power in an exclusive club, even if it means pursuing arms and prestige projects. Dr. Namrata Goswami is a senior analyst and author. Her work on “Outer Space and Great Powers” was supported by the MINERVA Initiative Grant for Social Science Research. Currently, she is working on a book on “Great Powers and Resource Nationalism in Space” to be published by Lexington Press, an imprint of Rowman and Littlefield. Peter Garretson is Deputy Director of the Schriever Scholars Space Strategy and Policy Program at the Air Command and Staff College (ACSC). The views expressed in this article are those of the authors and do not necessarily reflect the official policy or position of the Air Force, the Department of Defense, or the U.S. Government. India's space program is making giant strides on the world stage, but it can still do more. Halal Tourism on the Rise in Asia, Just Not in ChinaIndonesia’s Surprisingly Quiet ElectionIndian Elections: Kashmir VotesAnatomy of a Taiwan Invasion Part 2: Missile and Naval DomainsIs the Taliban’s Former Capital Ready to Welcome Them Back?